The German watch brand UHR-KRAFT ® was founded in 1999. The name UHR-KRAFT ® stands for extraordinary. That fact is emphasized by ”kraft” in the name UHR-KRAFT ®. Also the homophone between UHR-KRAFT ® and ‚Urkraft‘(elemental force) was intended. The four elements (Earth, Air, Water and Fire) are standing for an almost invincible force. The brand is since 1999 an active player in the market and is developed as an insider tip for watch fans. You can find UHR-KRAFT ® on every continent, but not in massive stores, but in small, well-picked places, there, where you do not expect it. The conscious price positioning in the middle and upper price segment (from ca. 799,00 € to 3.500,00€) is chosen because it is possible to achieve individuality, usage of highest quality Swiss calibre, usage of valuable material (e.g. sapphire glass, titanium, butterfly clasp etc.) as well as top processing. From entrepreneur- decision we decided to dispense with expensive sponsoring and advertisement as this would boost prices. UHR-KRAFT ® = Time to be different! The Flagship Store in Essen is the homebase of UHR-KRAFT ® and contains about almost 150 square meters of shop and workspace. In addition, there is more room for the workspace of four watchmakers. In this Flagship Store, you do not only find the biggest choice in UHR-KRAFT ® watches (the complete collection, and rare, loved, special one of a kind editions from all the past years). Made in Essen, Germany. Limited Editions. Our master watchmakers are involved in manufacturing and repairing watches for decades. That is why they have a large know how in manufacturing watches, but also in service for every other watch brand. 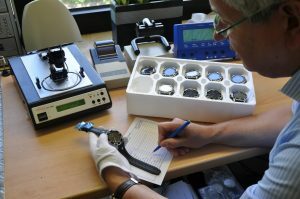 Since 2011, every UHR-KRAFT ® watch is manufactured piece by piece in Essen-Kettwig, Germany. From there the UHR-KRAFT ® watches are sent to national, but also to international clients from all places over the world. Our manufactory (from lat. manus “hand” and lat. facere “to build, do, make, create”) is mastering the production site of highly skilled watchmakers, whose different operations aim for a common final product, in this case an individual watch. The watches of the Brand UHR-KRAFT ® are made from the initial idea, over the design to final assembly. The calibres are almost exclusively obtained from high-quality Swiss manufacturer. The cases are manufactured from high quality stainless steel (quality 316 L). Choose from the colours: S/S, rose gold (18 ct pad), IP black (ion-plated) or bicolour rosé gold/IP black. For our watches we use anti-reflective Sapphire Crystal – the hardest among the watch-crystal and polished mineral crystal, the surface of which is harder than steel. Our watch straps are made of exclusively selected leather and rubber. Most models are available with a butterfly clasp.